The luxurious showroom features multiple vignettes that showcase the latest designs and products in the industry. They aim to provide the best possible choices to their customers along with the highest quality customer service. 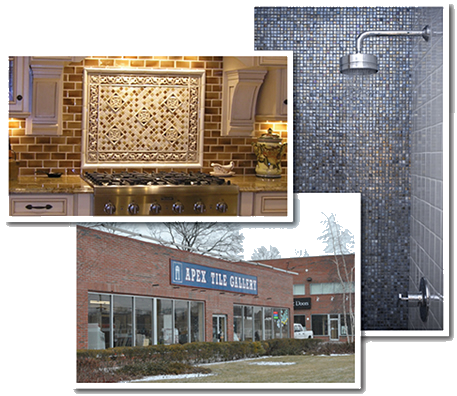 APEX’s selection of porcelain, ceramic, glass, and metal tiles come directly from their own warehouse or from highly certified vendors. Each staff designer comes equipped with either formal training and/or experience in interior design and a passion for customer satisfaction. Their step-by-step planning process starts with the creation of a storyboard that provides customers with a visual presentation of how their selections look side by side and what their final product might look like. From design to installation the APEX team guarantees that their customer’s voices are heard while their needs are met or exceeded. Building on the positive reputation of APEX Marble and Granite, APEX Tile Gallery has created a name for itself while setting an industry standard. Their passion and experience truly makes this a labor of love, the exact result that Tom and Elena had envisioned. Each of our bathrooms is a work of art and I love them all for different reasons. Perhaps my favorite is the first floor powder room – the flooring/molding looked great. The cabinet is a perfect size and the granite surrounding the sink is the icing on the cake.